What is TikTok, and am I too old to use it? Screenshots from the TikTok app show the variety of quick-hit videos shared by users. Hello, person who is, statistically speaking, a human adult aged approximately “millennial” to “boomer.” The analytics suggest a high likelihood that you’re aware there is an app named TikTok, and a similarly high likelihood that you’re not totally sure what it’s all about. Maybe you asked someone younger in your life, and they tried to explain and possibly failed. Or maybe you’ve heard that this new, extraordinarily popular video app is “a refreshing outlier in the social media universe” that’s “genuinely fun to use.” Maybe you even tried it, but bounced straight out, confused and sapped. And while you, perhaps an anxious abstainer, may feel perfectly secure in your “choice” not to join that service, Snapchat has more daily users than Twitter, changed the course of its industry, and altered the way people communicate with their phones. 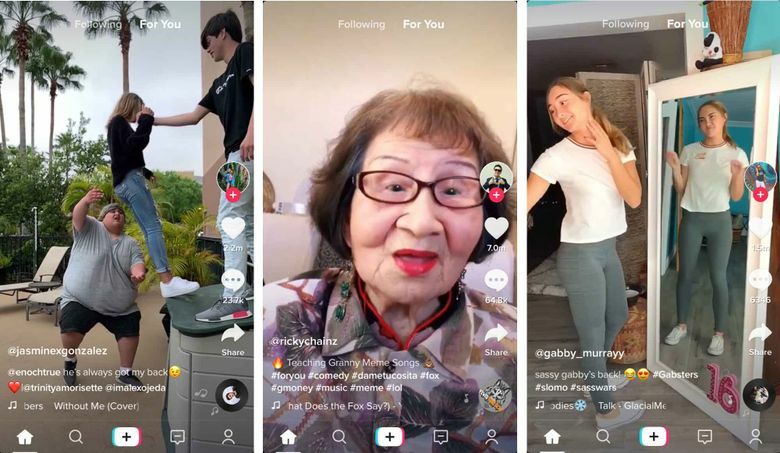 TikTok, now reportedly 500 million users strong, is not so obvious in its intentions. But that doesn’t mean it doesn’t have them! So what’s it all about? TikTok can feel, to an American audience, a bit like a greatest-hits compilation, featuring only the most engaging elements and experiences of its predecessors. This is true, to a point. But TikTok — known as Douyin in China, where its parent company is based — must also be understood as one of the most popular of many short-video-sharing apps in that country. This is a landscape that evolved both alongside and at arm’s length from the U.S. tech industry — Instagram, for example, is banned in China. U.S. social platforms, each fighting their own desperate and often stock-price-related fights to increase user engagement, have trended in TikTok’s general direction for a while. It is possible, today, to receive highly personalized and effectively infinite content recommendations in YouTube without ever following a single account, because Google watches what you do, and makes guesses about who you are. And while Facebook and Twitter don’t talk about their products this way, we understand that sometimes — maybe a lot of the time — we use them just to fill time. They, in turn, want as much of our time as possible, and are quite obviously doing whatever they can to get it.